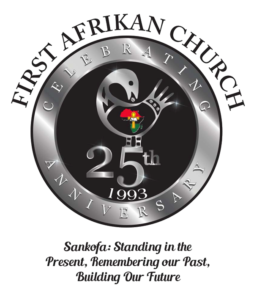 The Church is the only long-standing, viable institution that Afrikans in North America possess. It is the only option we have that is stable and strong enough to aid Afrikans in reconstructing the social network (families, neighborhoods, and schools) establishing and supporting Black owned businesses, and reconnecting brothers and sisters recently released jails and prisons to loving families and safe communities. For all of my people who are critiquing and criticizing the Black Church, my only question is what viable alternative are you offering? The critics of the Black church may just want to put up or shut up! I’d rather that they put up. The church is not the preacher (and I know there are a lot of unprincipled preachers out there). The preacher is often the de facto head of a congregation, called by God to serve the people of God with energy, intelligence and imagination. And the truth of it is that most preachers are faithful servants of God and God’s people. Most preachers are not rich, are not trying to get in the people’s pockets or to sexually exploit the sisters and / or the brothers. Most preachers are good, God-centered, Jesus-focused, faithful proclaimers of God’s word relative to the degree of formal training they possess. Yet, the church is not the preacher. The church, rightly understood, is the body of believers in God through the Christ. 1 Peter 2:9 refers to the church as a “a chosen race, a royal priesthood, a holy nation.” John 15 refers to Christ as the vine and the church (his followers) as the branches. And 1 Corinthians 3:9 says “For we are God’s servants, working together; you are God’s field, God’s building.” These are just a few of numerous metaphors for the church in the bible. Each one of the biblical metaphors of the church teaches that the church is comprised of people who possess faith in God through the Christ. Further, the church is gifted. Each and every member of the church possesses gifts from God to be used in the fulfillment of God’s will as well as for the glory of God and the benefit of God’s people. Not all spiritual gifts have something to do with worship. In fact, most of them relate to the on-going maintenance and sustenance of the community of faith. The church is the mystical community of believers united by a common faith in God, a common commitment to follow Christ, and a common ethic to love one another. Should we the believers in God through Christ come to recognize the Black Church as God’s gift to us to do the work of rebuilding the social network, establishing, re-establishing and sustaining Black-owned businesses, and reconnecting recently released sisters and brothers to loving families and safe neighborhoods, then our living would not be in vain.